Newest building on Esri campus. In 2007, Esri continued to focus on its core mission of supporting GIS users around the world. We completed many projects, advanced our technology significantly, and grew about 13 percent. This article provides a description of some of these efforts and achievements. We are genuinely appreciative of this opportunity to support our users. The GIS community continued to advance the use of geospatial information as a strategic tool for analysis and decision making. Throughout the world, private companies, government agencies, and nongovernmental organizations (NGOs) used GIS for a wide range of applications, from organizing and monitoring workflows to predicting the future with geographic modeling. In the opening address of the 2007 Esri International User Conference, Jack Dangermond suggested the world has many problems to solve, including an ever-increasing population, global warming, social conflict, natural resource shortages, loss of biodiversity, and security concerns. GIS is providing both a framework for understanding, communicating, and responding to these challenges, as well as a formal set of tools, methods, and workflows that supports collaborative solutions. The work being carried out by literally thousands of our users around the world provides the evidence that GIS will play an important role in managing and planning our future. The Esri organization, including all of our affiliates around the world, continued to grow in 2007. There are now more than 5,000 employees in Esri and its international distributors that focus on supporting the GIS community. In addition, Esri supports more than 2,500 business partners (developers, consultants, and data providers) as they grow a global network of enterprises to support our users. 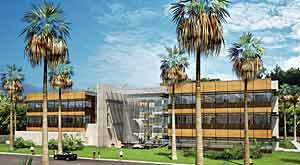 The year saw much expansion of Esri's Redlands, California, headquarters. This image and the one above are an artist's conceptions of the new administration building, which is currently under construction (see photo below). 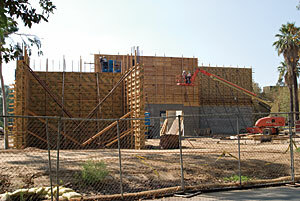 The Esri campus in Redlands, California, is expanding with an extension to the software development complex and the construction of a new administration building (see photos at right). The administration building will be completed later this year and will feature a briefing center for our users, a prototype laboratory, a 300-person auditorium, and space for many of Esri's support staff. The building is designed to integrate into the current campus with emphasis on natural light, open space, and energy conservation. The auditorium will be used to host conferences and symposiums. Each year a significant portion of Esri's revenue goes into research and development. Our growth in 2007 continued to support major investments in software development guided by feedback from our users. (Our newest product developments are described in the "ArcGIS Product Suite"). In 2007, our strategic direction included increasing the performance of our software and making it more functional and more capable of supporting enterprise implementations. In addition, we continued to work on integration with the Web, mobile solutions, and full integration of image data management. All of these efforts are being enhanced in collaboration with business partners around the world. Esri continued to focus its Professional Services support on strategic, leading-edge projects that help to grow the use and capabilities of GIS among our user and partner communities. In 2007, these efforts included federal government entities, such as the National Geospatial-Intelligence Agency (NGA), National Oceanic and Atmospheric Administration (NOAA), United States Geological Survey (USGS), and U.S. Census Bureau; various commercial organizations, such as BHP Billiton, Fireman's Fund Insurance, and United Site Services; and many local and state government agencies, such as the State of Mississippi, the City of New York, the City of Seattle, and the State of Washington. Services included implementation assistance and extended support services to a number of major clients developing enterprise GIS solutions. Examples included support to NGA, the North Atlantic Treaty Organization (NATO) for its Core Geographic Services, and the U.S. Department of Homeland Security (DHS). Esri also provided technology transfer assistance to its business partners for specific phases of their GIS projects ranging from short-term technical consulting to long-term enterprise assistance. These were provided via the Enterprise Business Partner Advantage program, a special type of engagement that helps partners with their products and services. Esri provided significant support for homeland security agencies and projects, including the Federal Emergency Management Agency (FEMA), U.S. Forest Service, and other responders as they fought the fires that swept through Southern California. The Arizona Counter Terrorism Information Center (ACTIC), California Department of Justice (DOJ), Indiana DHS, Jackson State University National Center for Biodefense Communications All Hazards (ALLHAZ) initiative, and U.S. DHS. Other clients include the Agip Kazakhstan North Caspian Operating Company N.V. (Agip KCO), a petroleum exploration and development organization, and the State of Qatar. These services allow us to understand the complex conditions often associated with GIS implementation so we can better engineer our core GIS technology. During 2007, Esri added six international companiesEsri Chile S.A., Esri Eastern Africa Ltd., Esri Lebanon sal, Esri Muscat CO LLC, Esri Northeast Africa, and Esri Turkey. Also, in the Republic of Georgia, GIS & RS Consulting Center GeoGraphic Ltd. was selected to become part of the Esri international distributor community in 2007. There are now 29 Esri international companies and 66 other international distributors serving more than 150 countries. Part of Esri's business strategy is to continue strengthening this international network of globally connected and locally focused organizations. Esri supported more than 100 user conferences staged throughout the world, which attracted more than 60,000 attendees. These included the International User Conference with 13,000 users and 1,000 business partners, as well as regional user groups in Europe, Asia, the Middle East, and Latin America. In addition, dozens of national and subnational meetings brought together users to share what they were doing and learn more about what Esri and our partners are developing. Esri also supported meetings for specialists in the oil and gas, health, business, U.S. federal government, homeland security, electric and gas utilities, surveying and engineering, education, and conservation communities. Esri received many significant and strategic contracts in 2007, including a strategic alliance agreement with the government of Malta, a major system for NATO in Europe, and an extension of the global agreement with Shell International Exploration & Production. Other important contracts included enterprise licensing agreements with CEZ in the Czech Republic; the Department for Environment, Food and Rural Affairs in the United Kingdom; EWE, one of the largest German energy providers; and Sempra Energy in California (USA). Other major sales included New Zealand Defence; Saudi Aramco; the governments in Queensland (Australia) and Singapore; and electric companies, AES Sul and Electro Paulo, in Brazil. Esri's international operations have also maintained cooperative relationships with international partners like AED SICAD, BAE Systems, Hewlett-Packard, IBM, Microsoft, NAVTEQ, SAP, SAS, Telcordia, Tele Atlas/TomTom, Telvent Miner & Miner, and Trimble, among others. In June, Esri launched the Esri GIS Education Community portal (www.esri.com/edcommunity). This site provides an environment for the exchange of ideas and experiences among educators around the globe, as well as information from Esri about curricula, training, research, software, and data. With the range of free to inexpensive Esri software and multiuser licensing options in place for schools, it is difficult to maintain an accurate fix on the spread of GIS at the K�12 level of education. However, it is clear that it continues to expand. For instance, more than 54,000 copies of ArcExplorerJava Edition for Education (www.esri.com/aejee) have been downloaded, and nearly 22,000 copies of the award-winning Mapping Our World: GIS Lessons for Educators (www.esri.com/mappingourworld), with its one-year license of ArcView, have been distributed. Significant GIS educational activities occurred in 2007, including the release of new curricular materials, in the United States, Finland, Norway, Germany, South Africa, and Switzerland. While Esri focuses most of its attention on instructional and research aspects of GIS in education, activity continues to grow in the use of GIS by educational institutions themselves for their own facility management, scheduling, planning, and administration. Worldwide, more than 1,300 libraries and 500 museums use Esri's GIS software. This encompasses a diverse body of institutions: public, private, university, and research entities and public museums, natural history institutions, aquaria, arboreta, art centers, botanical gardens, children's museums, historical sites, nature centers, planetariums, science and technology centers, and zoos. In these settings, the ways GIS is applied are equally diverse. In 2007, Esri launched a gardens and GIS initiative collaborating with the Missouri Botanical Gardens in St. Louis. This was initiated at a GIS conference where horticulture specialists from many gardens around the world came together to create a special community in the application of GIS to garden management and related botanical research and conservation. This initiative consists of a grant program and data modeling effort to support botanical gardens and zoological parks around the world. Applications for grants will be accepted through June 30, 2008 (www.esri.com/grants). In 2004, Esri began a collaborative program of grants and other support for the U.S. 4-H Club organization and its parent, the U.S. Department of Agriculture. Currently, 4-H clubs in more than 500 U.S. counties are working with GIS (www.esri.com/4-h). This has been a fast-growing and very successful program for getting kids active in their communities and learning about GIS and its applications. Early in the year, the Boy Scouts of America accepted a proposal for a GIS merit badge, and requirements development is now under way. Youth involvement with geospatial field science is also active outside the United States. In 2006, Esri Geoinformatik GmbH, Esri's distributor in Germany, began an annual series of summer camps in concert with German national parks. In 2008, four German events are scheduled, matching the number for 2007, and the effort is expanding to include one in Switzerland. To learn more about the Esri Education Program and Esri education users, visit www.esri.com/edcommunity. Initially endowed by Esri in 1991, the Society for Conservation GIS (SCGIS) is the world's largest and oldest conservation technology support program. The society relies on support from volunteers around the world, and its expressed core values are "service to others and commitment to the nonprofit mission." Annually, the society provides about US$50 million in services and software, including 1,000 software grants from Esri. SCGIS is also supported by the Nature Conservancy and the Gordon and Betty Moore Foundation, and this year SCGIS has formed a new collaboration with the Society of Conservation Biology. In 2007, Esri supported a number of other programs, including the Census Mapping Workshops with the United Nations Statistical Division; the Global Earth Observation System of Systems (GEOSS) (www.earthobservations.org); and SERVIR, a regional visualization and monitoring system for Mesoamerica that integrates satellite and other geospatial data for improved scientific knowledge and decision making by managers, researchers, students, and the general public (www.servir.net). Esri has set up a small (U.S.-focused) program to help our users search for grants that meet their needs and to assist with grant application narratives. The Grant Assistance Program (GAP) has helped several hundred government agencies, nonprofit organizations, and education institutions with grant searches and grant applications. For more information about the Grant Assistance Program, visit www.esri.com/grants. In 2007, users continued to take advantage of Esri's Enterprise License Agreement (ELA) Program. Today, there are more than 100 organizations around the world that have chosen to license unlimited deployments of Esri software with maintenance under a single contract. In the United States, this includes most of the federal government agencies in four states, many large cities and counties, and a number of utilities and engineering companies. Late in 2007, Esri announced the Small Municipal and County Government ELA Program that allows unrestricted deployment of ArcGIS software within municipalities and counties with populations of less than 100,000 (see the cover story, "GIS for Small Governments"). Esri Press published 19 new books in 2007, including SMART Land-Use Analysis: The LUCIS Model; Understanding Place: GIS and Mapping Across the Curriculum; Arc Marine: GIS for a Blue Planet; and GIS Tutorial: Workbook for ArcView 9, Second Edition. Visit www.esri.com/esripress to browse the entire collection of Esri Press titles. In addition, Esri Press signed a new agreement with Ingram Publisher Services of Nashville, Tennessee, to improve book distribution. Instructor-led classroom enrollment continued to increase (13 percent), and 210,000 students enrolled in Web courses and prerecorded training seminars. Six new instructor-led ArcGIS classes were added in 2007. More than 40 Instructional Series podcasts covering various topics, such as ArcGIS Desktop software and extensions, cartography, editing, and the geodatabase, are now available for download, including 16 developed during 2007. This has been a very successful series with almost 350,000 downloads in 2007 alone. For more information and to subscribe to the podcast feed, visit www.esri.com/podcasts. In 2007, Esri unveiled the fourth learning pathway. Focused on geodatabase management, this series is designed for GIS end users, managers, and administrators who are responsible for using, designing, implementing, or administering a multiuser geodatabase. The pathway includes instructor-led and Web courses that cover working with and connecting to multiuser geodatabases, as well as techniques and strategies needed to install ArcSDE technology, design a multiuser geodatabase, load data, and manage a multiuser environment. Those completing a learning pathway will acquire knowledge and skills that can be applied directly to their jobs. Visit www.esri.com/pathways for more information on learning pathways. 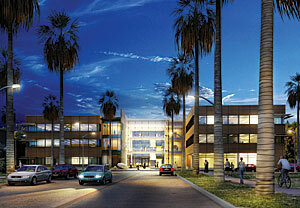 Esri Technical Support Services grew its staff by 25 percent in 2007. This is contributing to the depth, breadth, and experience made available to Esri customers. Results include improvements in response time and better customer satisfaction. Support was extended to assist our users during disaster response, a product quality improvement process. We recognize our success is the direct result of the support and feedback we receive from our users. We can't take this support for granted and will continue to seek to improve our efforts for our users and the world. Also read "The ArcGIS Product Suite Continues to Expand."